The islands of the Heronry Pond have a complex history, and it may be easier to consider them separately. The earliest island depicted within the Heronry Pond is on Rocque's 1735 Plan - a small circular island in the angle on the northern side of the pond. It is labelled 'The Mount', and is probably that depicted in Rocque's image 'The Mount in the Great Lake'. 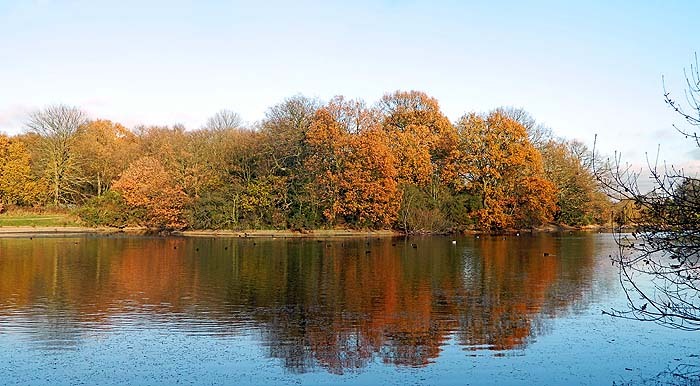 The island still exists today, although it is now much larger in size, having been extended to the west during the re-lining of the pond in 1906-7, when a substantial quantity of spoil was also piled on top of it. "The Mount in the Great Lake", an image from Jean Roque's 1735 plan of Wanstead Park. It is likely, though not certain, that this shows the island in what became known as the Heronry Pond. 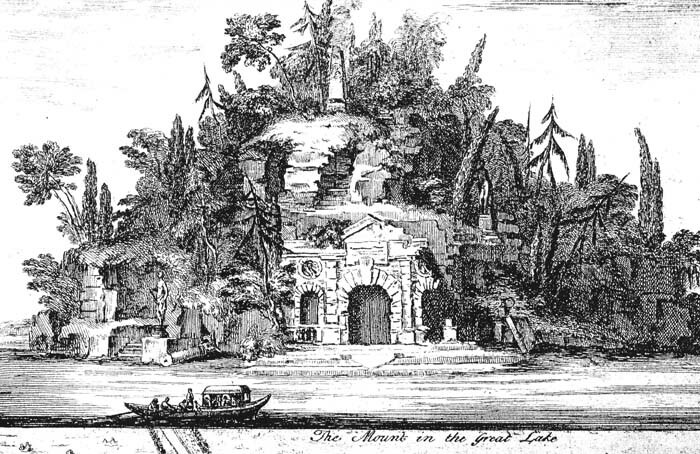 Whether the grotto was completed before Lord Tylney ran into financial problems in the 1740s is anybody's guess. The other island still surviving as such within the Heronry Pond is known as Buxton Island, in the western part of the pond. This was constructed ab initio from spoil during the re-lining of the pond in 1906-7. The Superintendent at the time was not delighted, saying: “in my opinion this island will be more or less of an eyesore”, but chose not to make a stand on the issue, probably for fear of adding to the spiralling cost of the project. Buxton Island, constructed in 1907. Small circular islands are depicted along the southern bank of the Heronry Pond on late eighteenth and nineteenth century maps. The number varies, but there seem eventually to have been four, and this may always have been the case. All were finally incorporated into the southern bank of the pond during the re-lining of 1906-7, though small promontories in the southern bank of the pond, separated by bays, mark the locations of three of them. A further two islands are depicted in the southern part of the Heronry Pond, towards the western side, on late eighteenth - early nineteenth century maps. The more eastern of these was a flat, wedge-shaped body planted with trees. This had disappeared by the late nineteenth century, having been re-incorporated into the southern bank of the pond, perhaps by silting of the channel. However, the western island survived until it too was incorporated during the re-lining of 1906-7. The narrow channel which surrounded it is still largely traceable as a dry ditch. The site of the western island is today surmounted by a substantial mount, which is crossed by an east-west path which has become deeply eroded. The date of the mount is uncertain, though a reasonable assumption is that it was constructed from spoil derived from the construction of the channels around it and the other southern islands, probably in the second earl’s time.